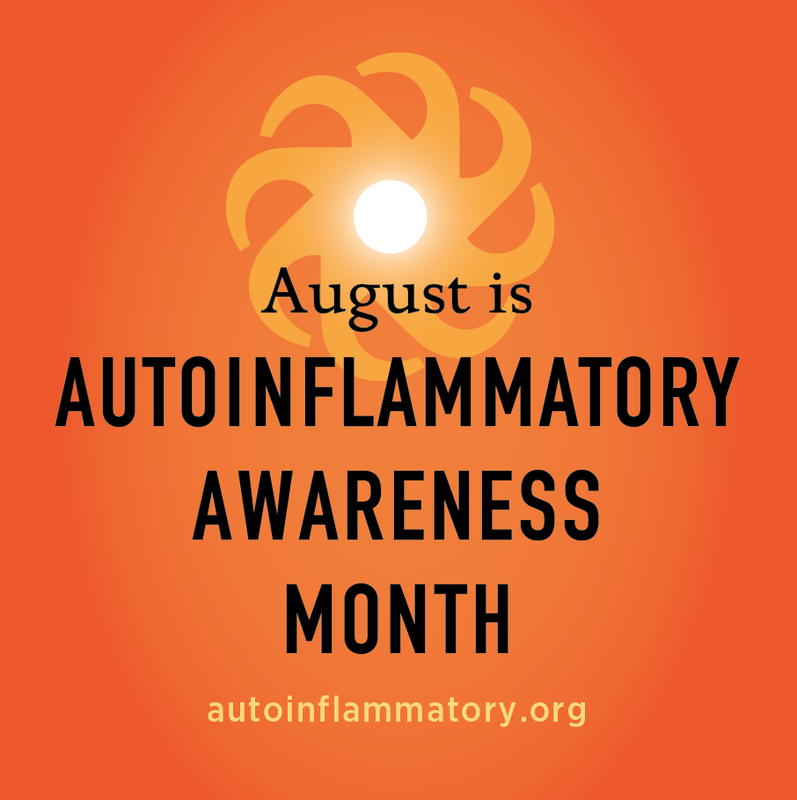 In honor of Autoinflammatory Awareness Month in August, we have set up a fun, easy “Virtual 5K Your Way” fundraiser to support the Autoinflammatory Alliance. Autoinflammatory diseases are rare, and many have been only recently been discovered in the past decade. Rare and new means many doctors have not learned about these diseases, and many patients can go undiagnosed, or misdiagnosed for years, without beneficial treatment that could help them greatly. Some of these diseases have severe, systemic damage that can develop in various organs, if left untreated. The most severe forms of these diseases can be fatal-sometimes in early childhood or later, if left untreated. Earlier diagnosis and treatment can greatly improve, and often change lives for the better. The good news is that many of these autoinflammatory diseases do have treatments available. There is a lot of hope that if we can help people get diagnosed and onto treatment, that they feel better, and be healthier. 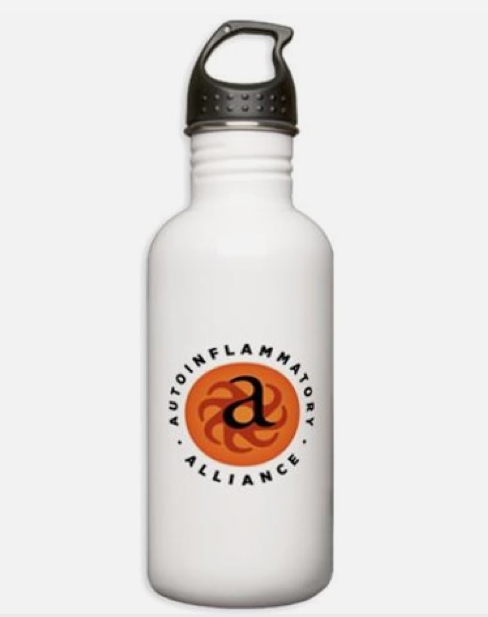 To raise awareness and education about autonflammatory diseases, the Autoinflammatory Alliance maintains several educational websites including this blog and the free online Autoinflammatory Database that doctors use to help diagnosis patients, attends rheumatology and autoinflammatory conferences in the U.S. and around the world, and helps hundreds of patients directly every year with concerns related to access to care and effective treatment. 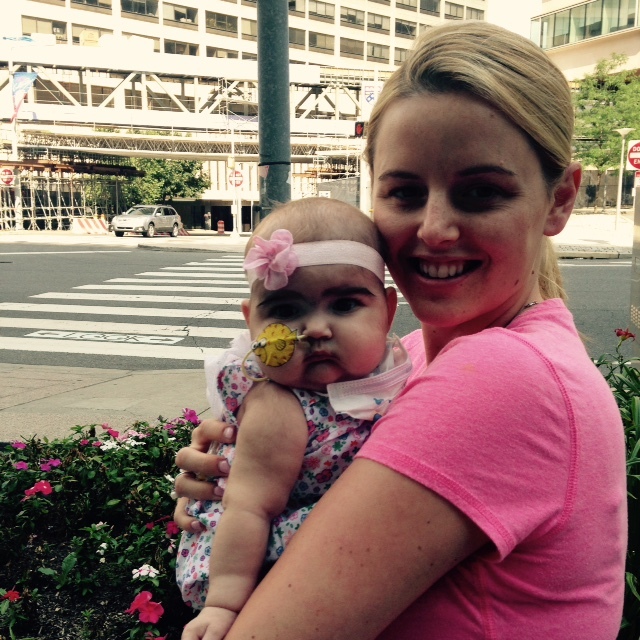 To make a difference and help more patients, we really need your help! Run, walk, skip, jump, craft, or host a board game night for the Virtual 5k Your Way Autoinflammatory Alliance fundraiser. 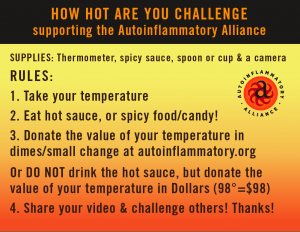 What do I need to do for a “Virtual 5K Your Way” fundraiser for the Autoinflammatory Alliance? This is a fun, easy, and creative fundraiser that you can do anytime, anywhere, and however you want to help raise money in honor of all the brave and amazing patients that face a lot of pain and challenges from their autoinflammatory disease daily. 1. Find a sport or activity that you like, and set up your own team, or support our main “Virtual 5K Your Way” fundraiser. You can run, walk, bike, skip, dance, swim, skate, rock climb, surf, or anything you like to do, and collect donations for your event. 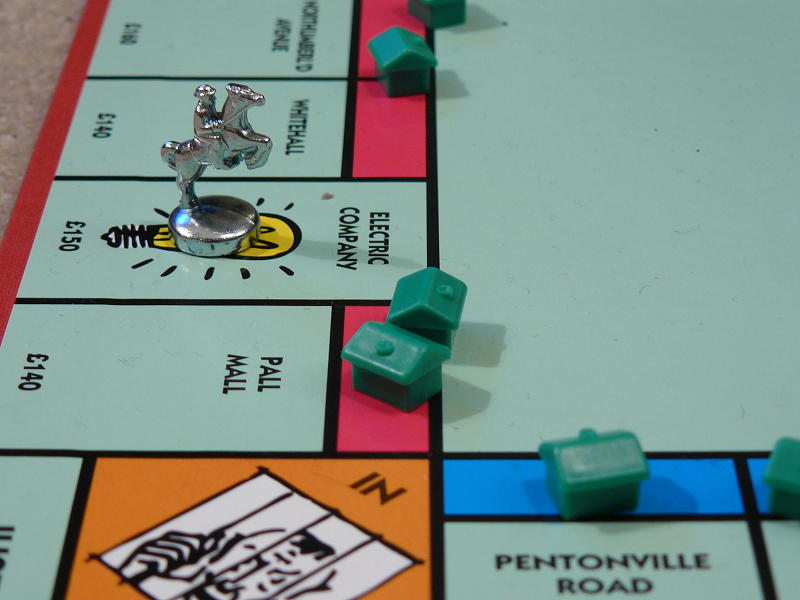 If you don’t want to do a sport for the fundraiser, you can have a board game, craft, or puzzle-making marathon, or just get friends and families to donate your cause. You do not have to host an event–but if you want to, that is great! 2. Share your photos with us of what you do–the more creative, the better! We would like to feature some of your amazing efforts to inspire others. We have a facebook event page where you can share what you are doing. 3. Have fun! If you just want to donate, that is fine too. Top Virtual 5k Your Way fundraisers will win prizes! 4. 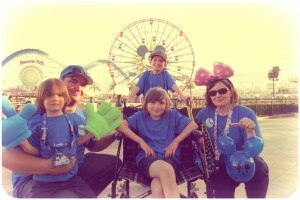 Earn great prizes for your donation, or for your fundraising team efforts! We have a number of recognition prizes, and something for everyone that donates $25 or more. You can view the prizes for each donation level on our “Virtual 5K Your Way” page. All donations are tax deductible in the US. Our IRS EIN is 20-4915307. 5. If you are planning an event (in August, or anytime) and want to have information, awareness bracelets, or other items for your fundraiser, please contact us. 6. You can also support some of the teams that are fundraising this month. Autoinflammatory Disease Awareness Bracelets are available for your event. Order here. 2016 is the year we need to “go big” on research fundraising-but we need your help! This year, we want to build a large research fund to help get more autoinflammatory disease research funded, and support more collaborative projects with doctors and medical centers to help more patients. We need to have your support and raise over $100,000 (ideally $200,000) to make a big impact and support more patient-centered research. Remember the ALS Ice Bucket Challenge? They raised over $200 million, but with only $1 million of those funds, they finally were able to find the gene that causes that disease, Imagine what could be done for autoinflammatory diseases with that sort of funding? This is possible with your help. 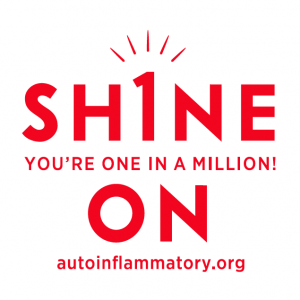 The Autoinflammatory Alliance is a 501(c)(3) non-profit public charity run by a diverse board of patients and parents dealing with autoinflammatory diseases. The majority of our work is done on a volunteer basis, with low overhead and donated use of technology, internet, phone, and office space so we can use our donations to the fullest possible. We try hard to make every dollar donated go the farthest. We are already doing big, innovative, and beneficial projects that make an impact, but we could do so much more if we had greater funding. Our current awareness efforts and materials have made a big global impact: we are a leader in autoinflammatory disease information for doctors and patients worldwide. Our comparative chart of autoinflammatory diseases is the leading teaching guide to medical professionals globally. This has led to many more patients getting diagnosed and onto treatment. However there is a great need for more information, and updated materials, which we are working on, but we need more funds to get these projects done. We have the largest moderated private patient communities online for autoinflammatory diseases and are in touch with many patients daily that need help with finding specialists in their area and clinical trials for their disease, understanding their medical tests, procedures or genetics, and advocacy and help with access to genetic testing and treatment, and how to manage day-to-day life with an autoinflammatory disease. In 2014, we hosted patient picnics across the United States. We will have more of these events for families in 2016. We had a very successful care package program for Rare Disease Day 2015, that brought much needed support to almost 400 children with autoinflammatory diseases during the wintertime when many patients struggle the most with their disease symptoms. Imagine what we can do with more funding! Patients contact us to request printed materials about these diseases, such as our Healthier Ever After book and program that helps children and their families better manage life with injectable medications. Doctors contact us for these materials as well. These materials cost money to produce and ship, but make a big difference for many patients. 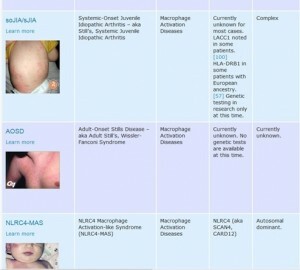 Our Autoinflammatory Disease Database is used by doctors worldwide to help get patients diagnosed faster. Donations help keep this database free and open to the public online. 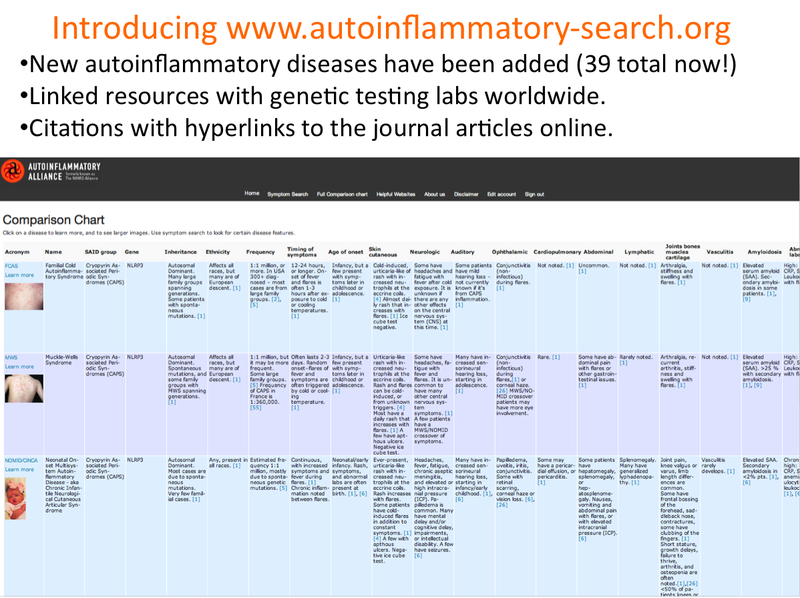 In 2015, we launched our searchable autoinflammatory disease database, with an updated, interactive comparative chart, hyperlinked references and links to other resources, materials and genetic testing labs. 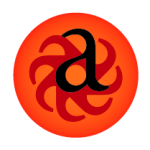 This project has used up most of all of our budgeted database funds, in addition to grants, and we need to raise more money so we can expand it’s features, and get the chart and this search site translated into other languages. More outreach to doctors, and support for patients will help more people with autoinflammatory diseases to get an earlier diagnosis, and helpful treatment that may change their lives. If you want to read more about how we help people with autoinflammatory diseases, take a look at our reviews on Great Nonprofits! Looking for some Autoinflammatory Alliance gear to wear for your event, or anytime? Visit our online cafepress shop. Here is a video featuring our first patient picnics for autoinflammatory diseases, from 2014. Many of these people had never met someone else in person with an autoinflammatory disease, or their same disease before these picnics. We want to bring more people together like this, and other events to educate, empower and energize our patient community, and also the doctors and caregivers of patients with autoinflammatory diseases, and we need your help. Please support the our fundraiser today! Thank you. 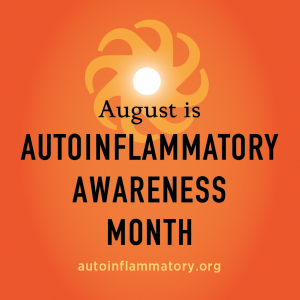 I am a Registered Nurse, President and Founder of the Autoinflammatory Alliance (formerly NOMID Alliance) and parent of three boys–one of whom has an autoinflammatory disease. It is my passion to help increase awareness about autoinflammatory diseases, and empower patients and medical professionals with information, materials and support to help them navigate the complex and challenging path towards diagnosis, and treatment of these rare diseases. In 2006, I founded The NOMID Alliance (now known as Autoinflammatory Alliance) to help increase awareness and improved care and treatments for patients with CAPS and other autoinflammatory diseases. It was the first, and only organization for all autoinflammatory diseases in the United States at the time. Our mission has always been to help patients of all ages with any of these diseases, and we have continued and refined our efforts with our recent name change to the Autoinflammatory Alliance. To help educate and increase more awareness, I co-authored the CAPS medical guidebook that was first published in English in 2008, and small comparative disease chart, and the 2012 version in English and Spanish. I am one of the main authors of the first Comparative Chart of Systemic Autoinflammatory Diseases that was was released with the poster presentation with a published abstract at the Autoinflammation 2013 ISSAID Congress in Lausanne, Switzerland. In addition, I have developed and edited our website since 2006, this blog (along with Jennifer Tousseau), and wallet-sized disease information cards for patients on various autoinflammatory diseases. I have worked in pediatrics for most of my nursing career, from emergency/trauma to research and instructing student nurses in various pediatric units in hospitals throughout the San Francisco Bay Area.